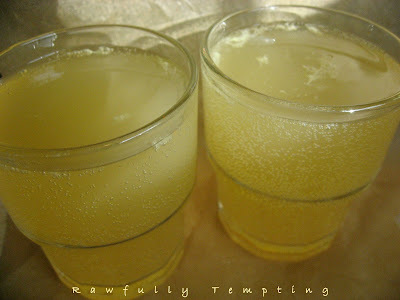 Water Kefir is an effervescent and refreshing probiotic beverage made by fermenting water kefir grains. Water kefir grains are a colony of good organisms that feed off high quality organic sugars and in turn convert your water into a lovely gut-friendly, probiotic beverage. 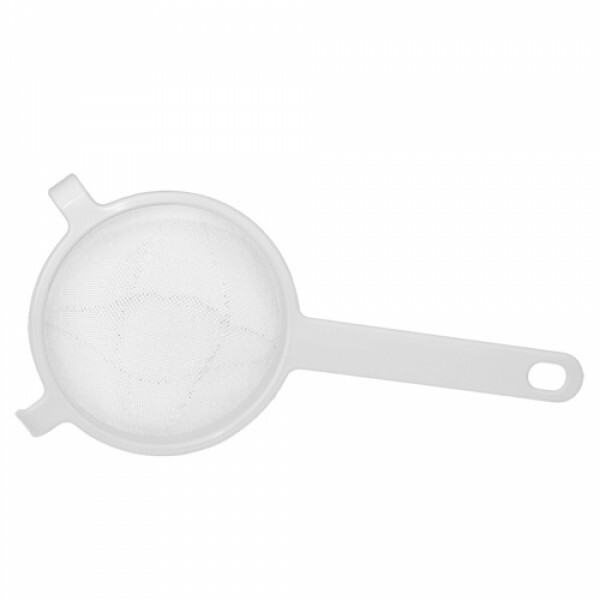 - Product: ¼ cup (4 generous tablespoons) of live, organic water kefir grains. - Detailed 11-page instruction guide. This guide contains step-by-step directions on how to prepare your water kefir, along with some recipes to get you started. Instructions are sent via email with notification of shipment so you have time to gather the necessary tools and ingredients you'll need. - Email support as needed for tips or suggestions. Yield: Each batch of kefir grains produces about 4-6 cups of delicious water kefir. (24 to 48 hours) for 1st ferment, and another 12 to 24 hours for 2nd ferment (flavoring). (But they GROW/Mulitply - so as times goes on, you will produce more and more). Grains grow quickly and will produce more with each batch. Note – Growth is slower in colder weather. Why order from Rawfully Tempting? 1 - We ship real live cultures . Our kefir grains are grown in a combination of organic, mineral rich sugars - Whole Cane Sugar, Coconut Palm Sugar, and a mixture of high quality Sucanat, Turbinado and Demarara. Our grains also receive a periodic loving dose of unsulphured black-strap molasses. These high quality ingredients promote extra healthy and happy kefir grains. Due to the brown sugars, our grains will have a slightly brownish tint. Grains can thrive in any desired sugar and will change color based on the sugar used. We choose to feed our grains the very best. 2 - Grains are all taken from real water kefir just before shipping. They arrive active and ready to make quality kefir. 3 - We ship in a box! No smashed grains from padded envelopes. 5 – We offer high quality kefir grains at very reasonable prices. Orders Ship Mon through Wed (USPS Priority Mail). Water Kefir Grains are Living Organisms. If you have decided to purchase these, please commit to taking care of them properly. If cared for properly, water kefir grains can last forever. When they multiply, share them with your friends and loved ones... Enjoy! 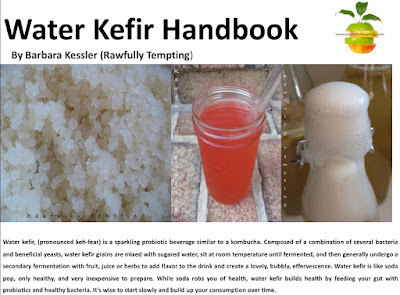 Detailed booklet (.pdf) provides step-by-step instructions on how to prepare water kefir. Break the soda habit, and create this lightly effervescent (soda-like) beverage for your loved ones. Fermented, this drink is chock full of pro-biotics and good for your gut. This booklet is included with any purchase of water kefir grains, however, many of you have requested the book be available separately. To purchase WK grains, see links above. For ebook only, Select - "Add to Cart" below. I want to thank you for starting me on my Water Kefir journey. I can say that you have been an excellent resource and your instructions and guidance have been superb. I am so enjoying the growth of my Kefir. I'm now up to 74 tablespoons and looking at ways to spread the Water Kefir love. I use it in so many ways and have even eaten it as is. I'm so happy I purchased from you. Thank you, thank you, thank you. You inspire me so much!!! My kefir grains are growing and I've got several batches going at once now, experimenting with different flavors. My favorite so far is coffee. Thank you for your support while getting started!!! I just wanted to thank you SO MUCH for my water kefir grains.....I started out with 1/4 cup I believe and have had them multiply to well over 13 cups of grains! Everything was explained in such GREAT detail and the personal support I received from you was so very much appreciated. I use my kefir water in smoothies, for my hair and I also use extra grains in my smoothies. THANK YOU! I want to Thank You for the KEFIR GRAINS I now have 27tbsps of KEFIR GRAINS and over a gallion of KEFIR ,enough for everyday and there still growing, I have Raw sugar to fall back on to feed them , but Ive fed them palm sugar and sometimes dates. This is working out just fine, I make a new batch every fourth day. Thank You! Thank you SO MUCH for the water kefir grains! I have been making lots of water kefir and my son and I drink it every day and love it. You were so great with providing the grains and wonderful instructions for how to work with them. Thanks to your advice, my grains are growing, very happy, and the water kefir tastes great! I can see how they respond to different sweeteners. We continue to experiment with them and the endless flavor possibilities. What fun! Thank you again! Rawfully Temptings' water kefir grains are incredibly healthy and fast producing. In less than a month, my grains multiplied from 1/4 cup of grains to over two cups. The water kefir produced from the grains is fizzy and lightly refreshing. Barbara is delightful and full of tips, ideas and suggestions. She was always available for questions and quick to respond. She treats her kefir grains like children! Don't hesitate to purchase your kefir grains from Rawfully Tempting. Barbara I'm so pleased with my new journey with Water Kefir. I love it, and my friends love it, and my husband loves it too! I'm having so much fun trying different flavors, blueberry, coffee, apricot and dried figs! Yum. Every single one is truly and amazing treat. I'm so glad I bought the grains from you, I hope more people will take delight in trying this themselves. Comment sent from Dana B - "The best in every way! i have purchased many different grains over the years. these grains have been lovingly and properly tended, are years old, and contain all the enthusiasm barbara exudes as well! she is a pro, shipped the next day, ( i even owed her more money and she shipped!) available 24/7, and my water kefir was/is SUPER fizzy; ALIVE teaming with probiotic goodness!! best ever! thanks barbara for all u do!!" Thank you, Dana!!! Comment sent by Linda S. - I intended to email you earlier to let you know how wonderfully the grains were doing - they have produced the best bubbly kefir and I’m so so pleased. Thank you. I’ve had much of my colon and small intestine removed 5 months ago due to a rare condition. And I’ve gone from an active on the go woman to someone afraid to leave my house. The water kefir is changing my life - putting those good probiotics into my body has been amazing and I want you to know that the grains I ordered from you are by far the best and most active I’ve ever ordered. So thank you Barbara so much for the work you do and also the education you provide. I attended the Water Kefir workshop on May 12, 2018. It was a wonderful experience! I have tried water kefir in the past, but without the information and passion that Barbara shared with the group. The kefir grains I received in class are happy and creating very fizzy Kefir. I am so glad I decided to take this workshop!